Sizzle, aka Crazybrizzles, is a 2½-year-old black female born July 26, 2010. Her sire is Dragon Fire and her dam is Char Jimmy Pop. 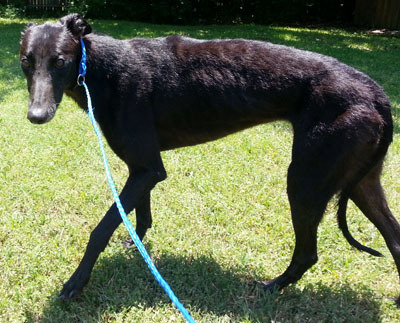 Sizzle has no races on record on greyhound-data.com and came to GALT from the Waco Humane Society where she arrived as a stray. Sizzle should not live with cats.